The purpose of this series is to look at televised pro racing events and suggest things club racers can learn from them. So, we're doing thought experiments, not offering opinion on F1 or IMSA or PWC per se. This requires a little bit of logic and imagination on the part of our readers. For example, we imagine here that F1 is run under NASA rules. It isn't, but to learn from other forms of racing it can help to do this. We've seen many drivers do a poor, inverted imitation of what we're suggesting, for example, taking lessons from F1 and then applying them literally to club racing, imagining that club racing is run under FIA rules, with FIA stewards and FIA tech. It isn't, so they get in trouble. We conclude that club drivers have to be able to place racing examples in the correct context. Hopefully, these examples give you a chance to better understand what may happen when you're on track. Good luck and happy practicing! So, can club racers learn anything from this? We'd say yes. First, exercise caution listening to announcers. They have very little time to formulate opinions and are often wrong. In the case of Vettel and Verstappen, DTM driver and former F1 driver Paul DiResta opined that Vettel was at fault because he "was off the normal racing line in Spoon (the corner where he attempted a pass)". 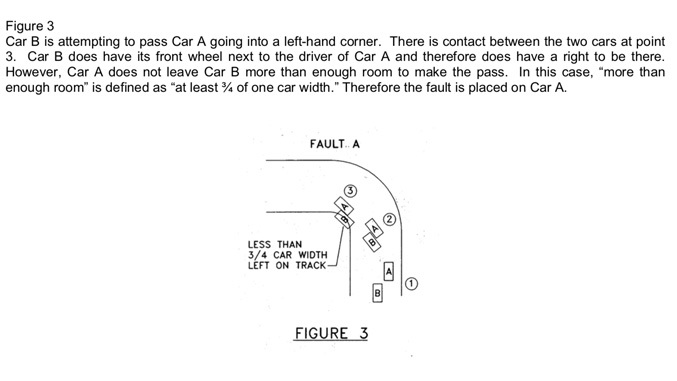 But, since the leading driver is supposed to be on the racing line, the passing driver must, by definition, be off the racing line in most passing situations. Vettel may have been at fault, but it wasn't for the stated reason. You may see that Verstappen could be judged at fault, but what do you really take away? The third learning from Vettel vs. Verstappen is that Vettel isn't exactly at the edge of the track and it is debatable, not obvious, whether Verstappen leaves him 3/4 of a car width of room (of course, F1 runs under FIA not NASA rules, but for club learning purposes we're imagining that F1 is a NASA /SCCA event). The point is that, if you rely on the rules for satisfaction, you don't want to rely on "winning" a very close call like this one. Verstappen could just as easily be judged to have done nothing wrong. The fourth learning is not to rely on steward's calls but rather on success on the track. In this sense, DiResta came back with the real reason that this pass was ill-advised: Vettel was passing in an uncommon passing zone so he took a huge risk that he'd get squeezed and hit. Verstappen may not be intentionally squeezing Vettel, he is just following the normal line there, which tightens up. Whether Vettel "won" a judgement or not, he lost on the track the instant he was hit, broke his car and he spun. The stewards can't correct for that, even if they decided to issue penalties, because fundamentally Vettel wasn't racing Verstappen, he was racing Hamilton (who would never have been penalized for this incident). Club racers should carefully evaluate the risk of their moves resulting in a bad physical, on-track result.